12 ladies entered (thanks to all) this mid-summer Lakeland fell race, a great result for the Bingley Fell Championship and for getting a team out for another English Fell Championship (EFC) race, both Ladies fell targets. Then the long hot summer began to break with a wet cold forecast , and life’s other priorities prevailed. 8 made it on the day with myself (Becky), Eleanor and Anna camping with partners and / or family. The forecast had improved and we set up camp in the sunshine on Friday at Turner Hall Farm overlooking the race start field. Saturday morning dawned with blue sky and sunshine. 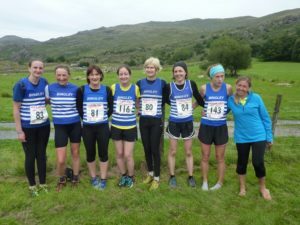 Campers were happy and Nicola scooped a car full up – Shona, Jo, Sue and Michelle, set the Sat Nav for Seathwaite, Dunnerdale and arrived 2 ¼ sunny traffic free hours later over Wrynose Pass. Jo was a little car sick but tea, coffee and cake at the Weight tent seemed to help settle things. Memories, for Sue, Eleanor, Jo and myself, of the recent recce with 40mph winds, being frozen in horizontal rain and hail, and in the cloud with little visibility were fresh and we were distrustful of the sunshine and blue sky. What to wear in addition to carrying full fell kit? We lined up amongst the 350+ starters for a midday start and we, and 5 Bingley men, were off. Shona was 7th F45 counter in the individual English Fell Championships (EFC) joining Denise Wright and Becky Weight in the F45 results. Becky, despite not finishing, is still top of the F60 category, and at the worst should be able to hold equal first after the last race. 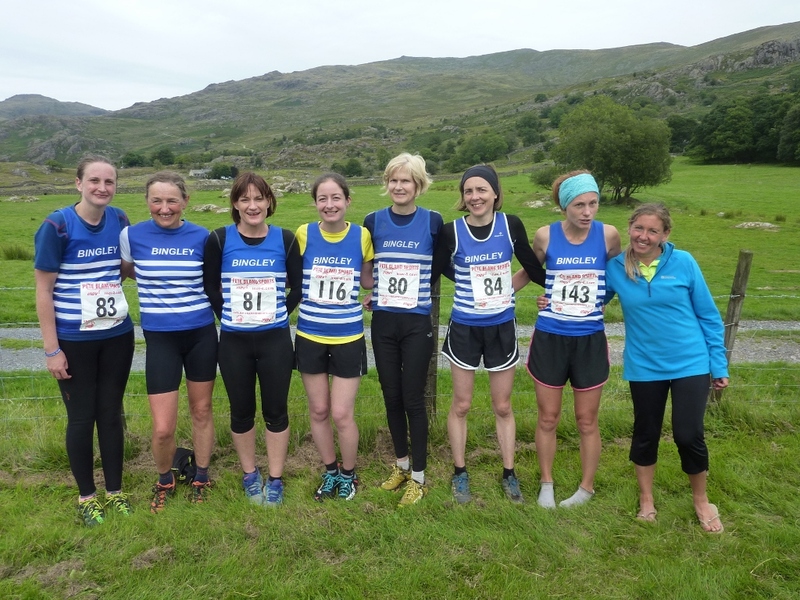 For Turner Landscape the ladies were 10th in the Open (Shona, Nicola & Anna) and 6th V40 (Shona, Jo & Sue) team in the EFC, bringing the teams to 10th and 7th respectively after 5 races. This is a great result especially considering the level of experience. Lakeland fell races are often a big step up from fell races in the Pennine moorlands and the Yorkshire Dales. 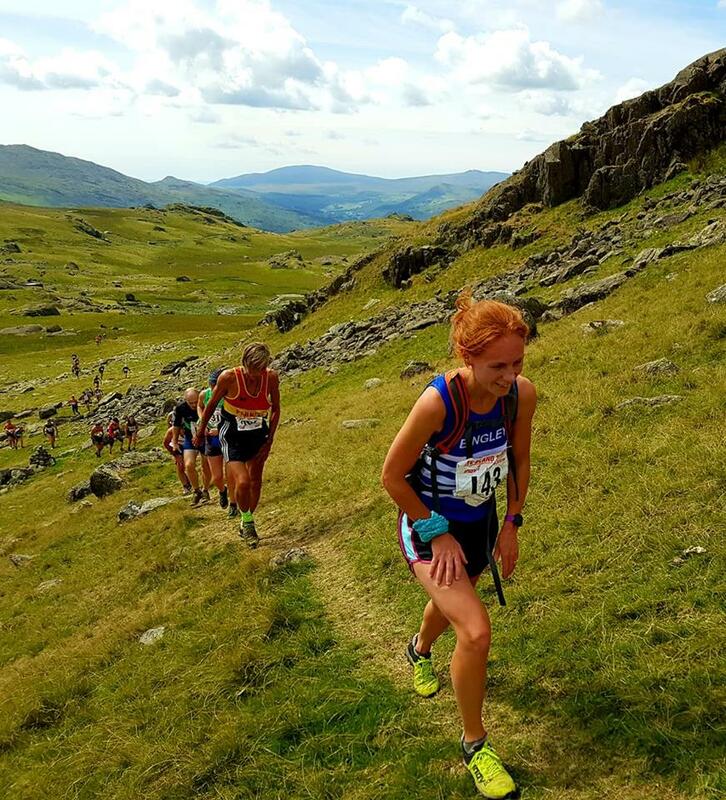 For Michelle, Nicola and Eleanor this was their first Lakeland fell race, only the second for Jo and Shona, Sue’s first for 10 years and since a persistent Achilles injury, and Anna is just getting back to running after her first baby. More experience will bring better results. The men were 10th V40 team (Robbie, Dave & James), making the EFC team listings in 16th place after 5 races. 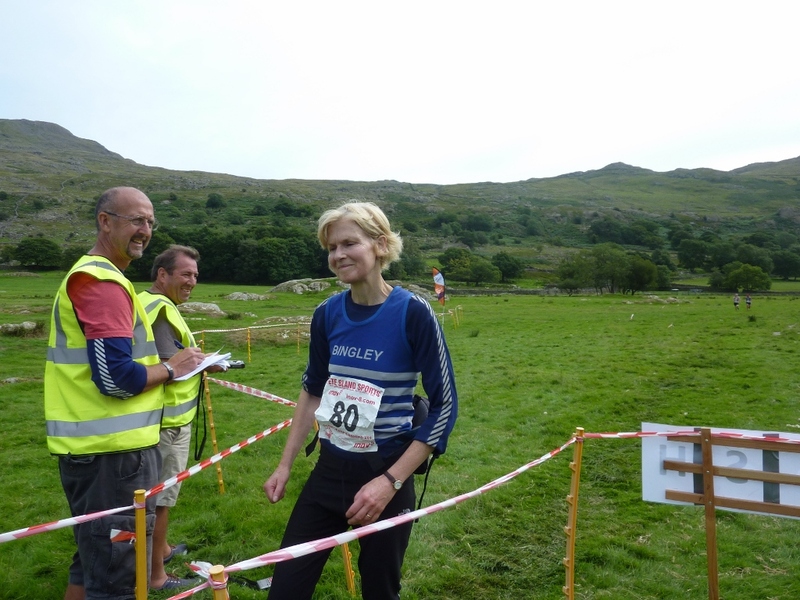 Dave & Peter gained points for the M55 and M70 championships. Well done guys. 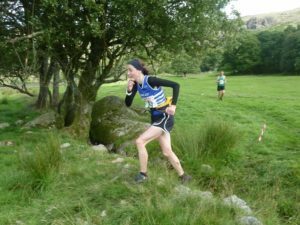 Nicola “As my first Lake District Fell Race, definitely brutal, challenging, scenic and an experience – but great fun as well. Fantastic team spirit, great hospitality in the “Weight Hospitality Tent” (offering cake, coffee, tea & flapjacks!) and a brilliant Bingley Ladies Day Out. 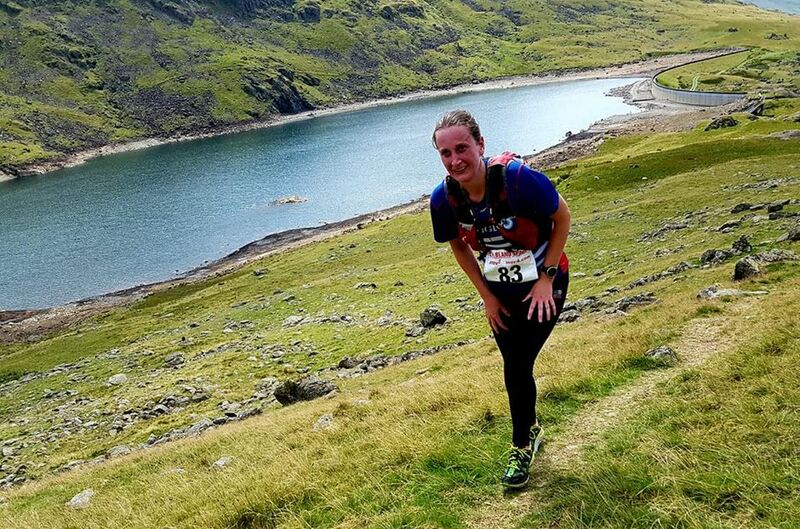 The day was far better than the recce and it was great to be able to see the scenery and the long line of runners ahead making their way up to the top of the first hill.” NB Nicola bought her first pair of fell shoes after the race having run in well worn smooth soled road shoes! 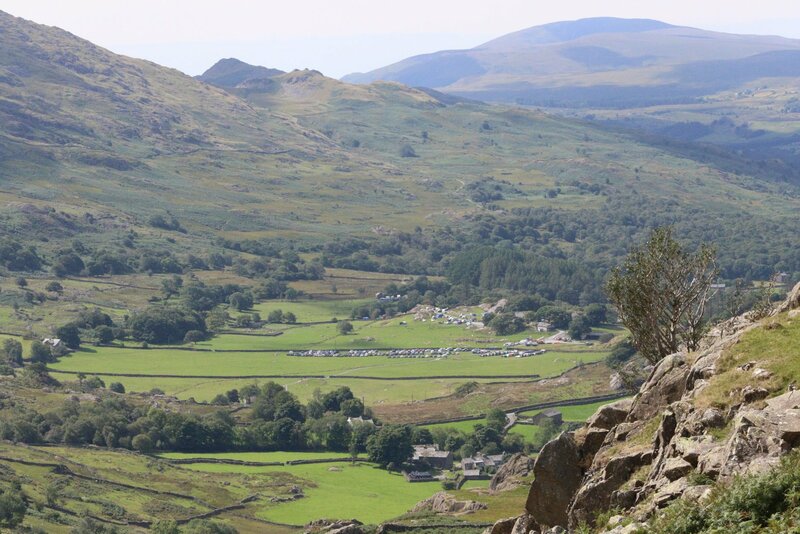 She did admit to being on her bum on some of the grassy slopes so scope for improvement there! Many thanks to Nicola for organising lifts and driving. 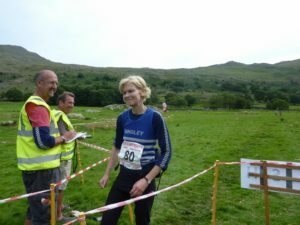 Michelle hadn’t been able to do a recce so had to rely on her navigation skills & common sense for her first Lakes fell race. 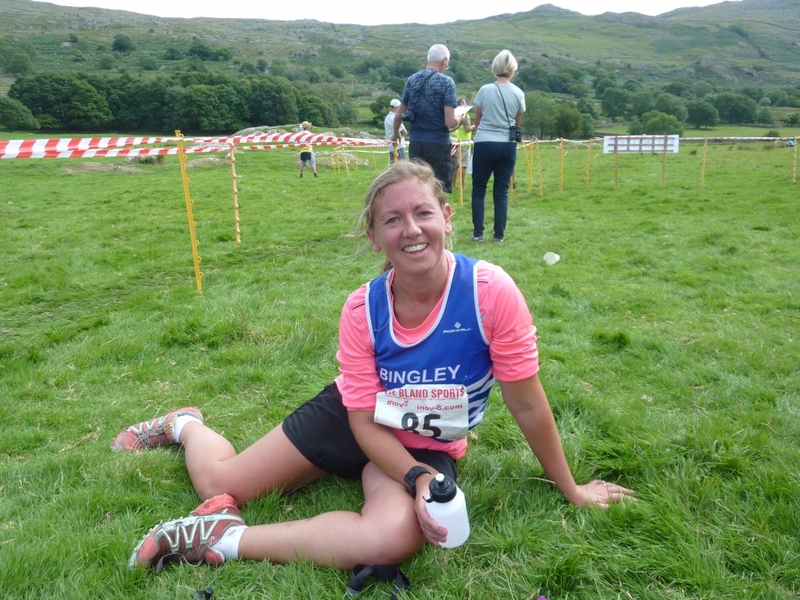 At the start …. 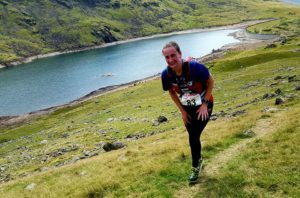 All the ladies agreed that Michelle gets the Bravery award for sheer guts, practical common sense, and her great ‘just do it’ approach. We are really proud of her achievement. 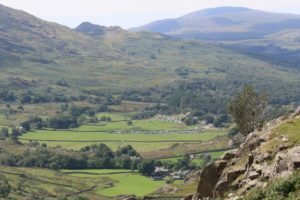 Anna and Michelle on the climb up to Grey Friars and the first check point; Heidi Martin’s photos. Celebrating a great ladies team day out. 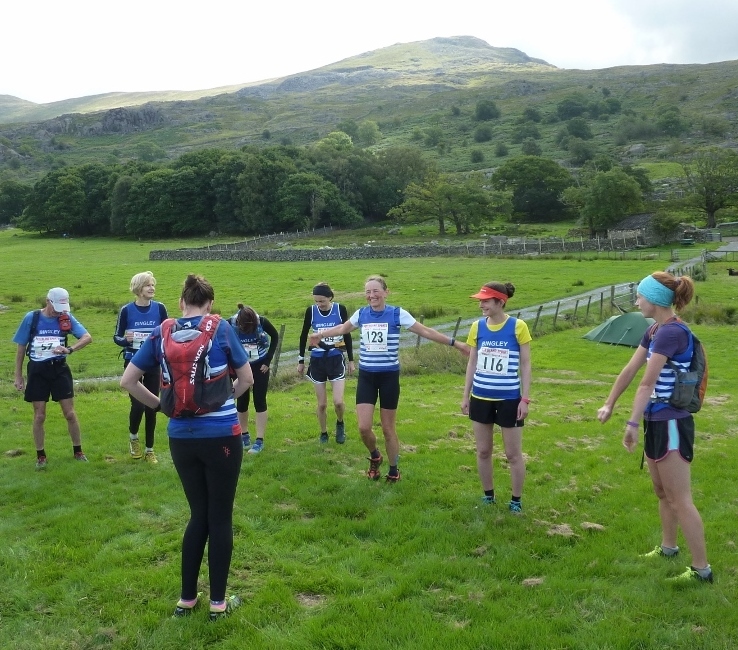 Thanks to everyone (and supporters) who entered, recced, travelled, ran, joined in, drove, baked, navigated, ate chocolate and courgette cake, shared, expanded their fell runners comfort zone, and helped make a brilliant day in the Lakes at its best.